Zimbabwe : 282/10 in 117.3 overs (Williams 88, Moor 63*, H Masakadza 52 ; Taijul 6/108, Nazmul 1/49, Mahmudullah 1/3) & (2nd innings) 1/0 in 2 overs. A poor display with bat on day two of first Test have put Bangladesh in a difficult situation as Zimbabwe took a healthy first innings lead of 139 overall 140-run lead at the end of the day at Sylhet. Zimbabwe started the second day with the overnight score of 236 for 5. Moor added some valuable runs in the first session while Zimbabwe kept losing wickets on the other end. Taijul grabbed four more wickets as the hosts were all out for 282. Moor remained unbeaten on 63. Taijul got 6 wickets for 108. 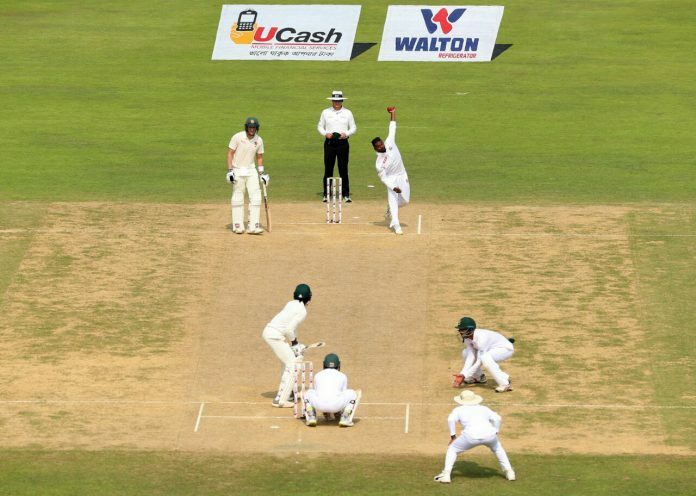 Bangladesh had a nightmare start by losing the first 4 wickets for just 19. Mushfiqur Rahim, Mehidy Hasan Miraz both got the start but failed to capitalize as Tigers were fall in further trouble. Despite debutant Ariful Haque’s 41-run knock, Bangladesh were bowled out for 143 in 51 overs. Chatara and Sikandar Raza both shared 3 wickets each. Zimbabwe batted for 2 overs scouring 1 run before stumps of the day’s play.